Ice cream pie is still pie! Today is 3.14159 (rounded to 4 decimals). 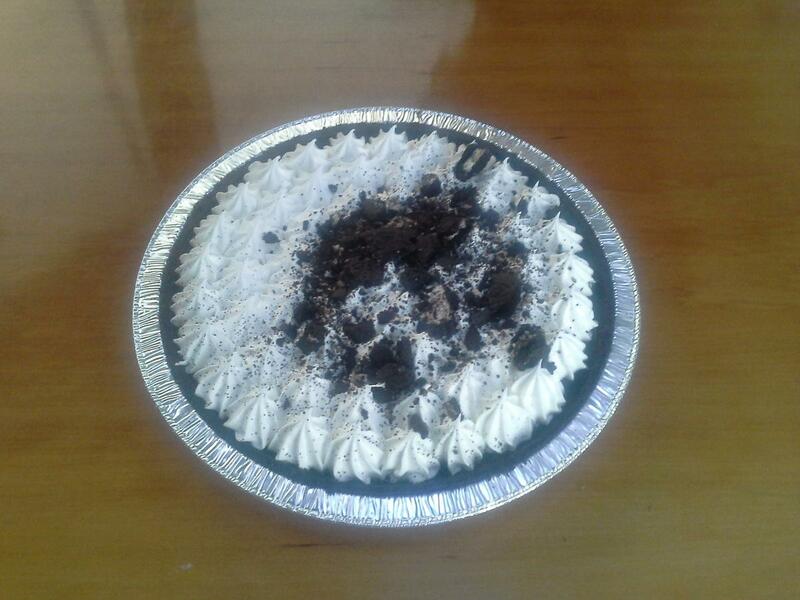 So we celebrated our last night in Fort Lauderdale with a Cookies & Cream Ice Cream Pie. Ice cream pie is officially still pie. We have spent the last week downtown on the New River. St. Patrick's day was noisier than most, but it was all pretty loud. The East Coast Florida Railroad has been haunting us since Titusville. It seems we are never more than a mile from that rail line. This time we were about 100 metres from a railroad drawbridge. Eight minutes before a train is due the siren sounds 4 times, then repeats every minute for 5 minutes. Then the bridge lifts, ah good, no more sirens. HONK... HONK... HONK... rattle rattle HONK. Since the train is running right through the downtown area there are numerous level crossings and the train must (by law) honk it's horn as it approaches each one. And this is one busy railroad! Some days there were 10 trains running through. We've been ordering from Amazon like crazy to get things set up better on the boat. Charlena got a new beach chair with shade (pics coming soon) that she loves. I have a seat so I can sit at my navigation station (why the boat didn't come with one is beyond me). Our new inverter/charger arrived and has been installed so we now have 120 volt power no matter where we are. The final parts for our watermaker arrived and will be installed shortly. We got a fuel transfer hose to move diesel from our portable tanks into the main tank. Previously we used a large funnel and poured, usually resulting in diesel all over the deck. We got lights for the dinghy, along with blue lettering to put the license number on the dinghy that will match the lettering on Sail Quest. I'll get a photo once they are on. We got two more add-ons for Catan (Oil Patch, and The Great River). More add-ons will come later. A Canon printer/scanner so we no longer have to seek out print shops every two weeks or so. I would love to have brought my HP colour laser from the old house, but it wouldn't fit anywhere. Two solar shower bags. These work AWESOME! We leave them on the deck during the day then have to add a bit of cold water when we are ready to shower. And they are easy to use too since the showers have small hatches in the ceiling, we simply leave the shower bags on deck and place the shower hose through the deck hatch. We also got lights for the dinghy so that we can use it at night. No more having to carry the lantern when we get home late. We are leaving tomorrow though and heading back north. Charlena has her surgery date at last, so we are getting ready to take a trip back to Canada.